ACTAtek Magnetic Strip Reader is a contact card solution using magnetic card technology which can had been successfully integrated with ACTAtek Unit to provide the user another option without changing the existing contact card. When you are limited in space, this small magnetic strip reader is an ideal solution which is well designed with badge length 90mm and also conform with ISO 7810-7813,JISII standards. 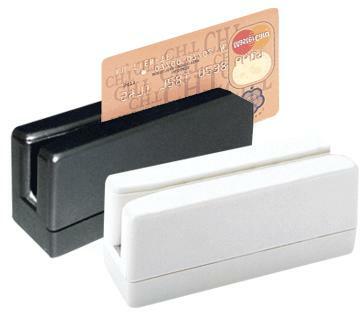 This magnetic stripe reader is also perfectly compatible with variety of bar code types. Through the RS232 interface, it works perfectly with ACTAtek device to read the contact card. Price/performance is great with a life-cycle of up to 1,000,000 passes and a scan rate up to 1,000 mm per second. Below is the sample diagram about how Magnetic Strip Reader can work with ACTAtek device..
Step1. Login to device's console menu to add Smart Card User.